The HESA publication Higher Education Statistics for the United Kingdom 2010/11 is released today. The National Statistics publication provides the official overview of the UK’s higher education sector in 2010/11 and is available as a paper volume or downloadable publication. The publication contains data from HESA, the Student Loans Company, OECD, UCAS and the Labour Force Survey. Commentary, summary tables and charts are provided in a free online introduction. The graph and table below show the trends in HE qualifications obtained by male and female qualifiers in each subject. The total number of HE qualifications obtained at UK HEIs has risen 17.1% over the five years 2006/07 to 2010/11. The number of qualifications obtained in science subjects increased by 14.0% over that period. The subject area with both the greatest number of qualifiers, and the greatest increase over five years, was Business & administrative studies. In 2006/07 female qualifiers outnumbered male qualifiers by a ratio of 14:10. In 2010/11 the difference had reduced slightly to 13:10. Male qualifiers outnumbered female qualifiers in six subject areas: Physical sciences, Maths, Computer science, Engineering, Architecture and Business studies. 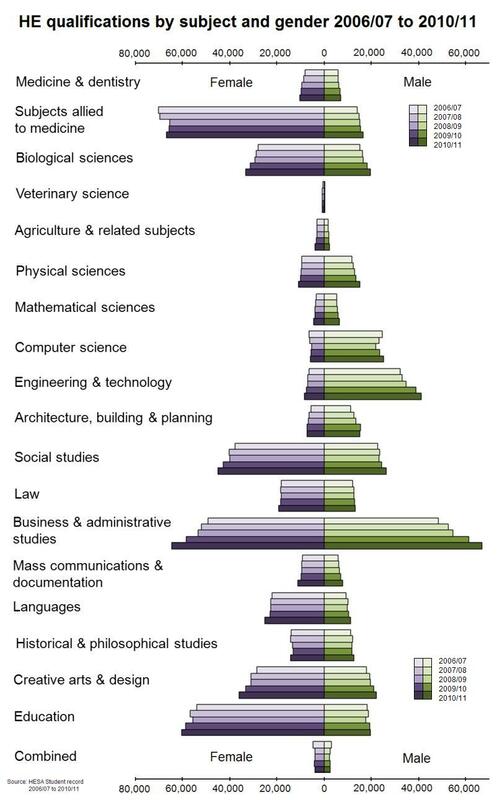 In the thirteen other subject areas female qualifiers outnumbered males, with the greatest imbalance in Subjects allied to medicine (mostly nursing) and Education. The table below shows the numbers of qualifiers in 2006/07 and 2010/11 which are the basis for the chart above. Higher Education Statistics for the UK is a National Statistics product which serves as a quick reference guide to high-level data on all aspects of higher education in the UK. A full introduction including commentary, summary tables and charts, is provided online. The introduction provides an overview of the key trends in higher education over the last five years. Data from the Labour Source Survey on qualification rates over time. Higher Education Statistics for the UK is available as a printed book or an electronic download. Both formats can be ordered online from our website. HESA appreciates the collaboration of all the bodies that have made data available for the volume, and in particular that of our colleagues in the Department for Business, Innovation and Skills (BIS), Welsh Assembly Government, Scottish Government and the Department for Employment and Learning (Northern Ireland) with whom we have worked closely in preparing it, in accordance with the arrangements approved by the UK Statistics Authority . Data for 2006/07 is based on the standard registration population used since 2007/08 which excludes students on sabbatical and students who are writing-up. The data for this year will therefore not perfectly match the data previously published in earlier editions of Higher Education Statistics for the United Kingdom. The data tables above relate to all UK HE institutions. Figures for the individual nations of the UK are available below [England, Wales, Scotland, Northern Ireland]. Veterinary science 0 0 0 0 0 0 .. Combined 0 0 0 15 5 20 ..